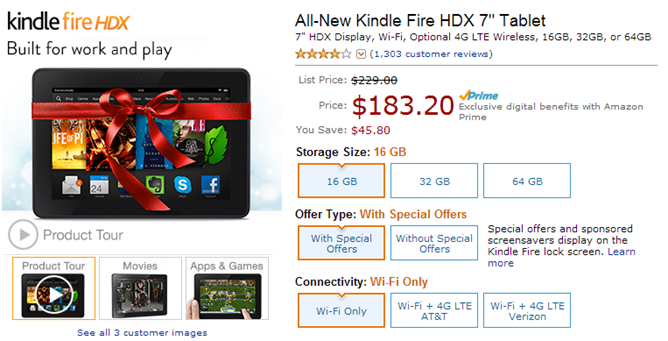 A week after Amazon took $50 off the price of the Kindle Fire HDX 7 for Cyber Monday, the company is back with another deal that will save customers nearly just as much money. For one day only, the 7-inch version of this year's Kindle tablet is available for 20% off, a savings of $45.80 on the version with ads and $48.80 on the one without. If you can live with Amazon's custom UI, the HDX 7 is a very attractive device. For just $183.20, you're getting a lightweight tablet with a Snapdragon 800 quad-core processor, a 1920 by 1200 display, and 16GB of storage. This deal does not include the larger, 32GB or 64GB models, nor does it apply to the cellular options. Assuming these aren't deal breakers, hit up the link below to jump on the offer while it's still there. And for anyone not turned off by older hardware, the 7-inch Kindle Fire HD is on sale for 20% off as well, bringing the cost of that device down to under $150. Not bad. Not bad at all.